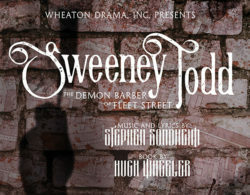 Attend the dark, witty tale of this Tony Award-winning Stephen Sondheim musical about love, murder, & revenge that is sure to both thrill and delight audiences. Gift certificates are available for all of our shows. Email tickets@WheatonDrama.org or call 630.260.1820 for more information. America's favorite ghoulish family return in this upbeat, explosive musical with a whole new storyline. In this uproarious comedy, 1939 Hollywood is a buzz as famed producer David O. Selznick must find a way to save the filming of what will become one of the most beloved films of all time, "Gone With The Wind". Experience Louisa May Alcott's familiar story of the four March sisters in a brand new way with this timeless, cozy musical perfect for a midwinter's eve. Just before his 1936 execution, Bruno Richard Hauptmann, the German immigrant convicted of murdering the Lindbergh baby, shares his side of this gripping tale in this dramatic play. In this creative play with music, the familiar story of Peter Pan is upended in an imaginative retelling of one orphan boy's ascent into literary history.